When I wrote my series of articles on the history of lens development I largely covered the period around the turn of the century. By 1860, photographers had decent portrait lenses, and we discussed that most of the superb prime lenses in standard focal lengths we use today had already been designed by 1905. I thought that about covered lens developments through the turn of the century and planned to start writing about camera development. But several people emailed that I had left out one other type of lens that was first designed about this same time, the telephoto lens. They were correct, of course. I’d left it out. Despite the numerous requests, (OK, it was 3. But 3 is a number, therefore I can call it numerous if I want to) I still wasn’t going to write about the development of telephoto lenses. Except that all three people who said “so and so first developed the telephoto lens” were wrong. None of them named the person who first made telephoto photographs. Most people don’t really know what a telephoto lens is. It’s not just a lens with a long focal length (although almost all telephoto lenses do have a long focal length). But if you ask most photographers they will pick a focal length and say anything greater than 50mm or 85mm or 100mm is a telephoto lens. If you ask more experienced photographers, they will likely say a telephoto lens has an angle of view of 35 to 10 degrees, and that lenses with less than 10 degrees angle of view are considered supertelephoto. This is more accurate, since it eliminates the variation caused by sensor size or camera format, but still not completely correct. 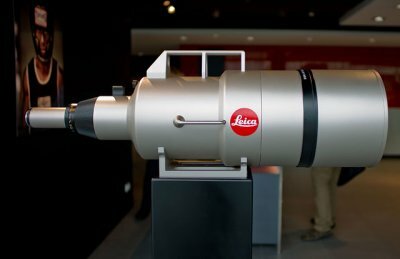 But if you ask a lens designer, they will tell you the actual definition of a telephoto lens is a lens with a physical length shorter than its focal length. So, for example, a Canon 100 f2.8 lens is not a telephoto (being 109mm long), while the Canon 100mm f2.0 lens is a telephoto (being 73mm long). The fact is, of course, that longer focal length lenses are more likely to be of the telephoto design simply because they’d become unwieldy if they weren’t. 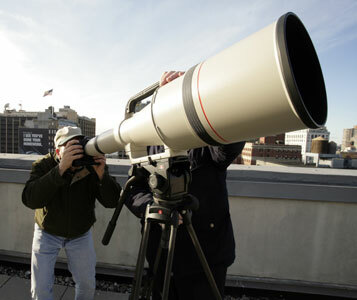 The Canon 500mm f4 is 15 inches long. If it wasn’t a telephoto design it would be at least 20 inches long, perhaps more. So what is this telephoto design of which I speak? Telephoto lenses all achieve the trick of having an effective focal length greater than the length of the lens the same way. They always have a positive group at the front of the lens with a negative element or group near the rear of the lens. Figure 1: A positive power lens above, and a telephoto lens below. The negative group widens the beam of light heading to the sensor, basically enlarging the image. It is this negative element that is the hallmark of a telephoto lens, and what makes the Effective Focal Length longer than the lens actually is. Figure 2: The yellow lines show the actual path of light through the lens. 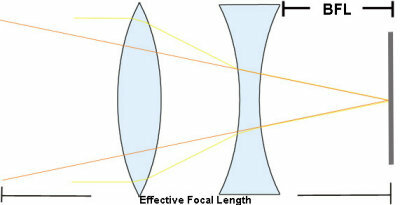 The orange lines represent the Effective Focal Length of the lens: because of the negative element in the telephoto lens the effective focal length is longer than the actual lens. The BFL, or back focal length, is the distance between the rear element of the lens and the camera sensor. Its not pertinent . . . . yet. Most photographic history books credit John Dallmeyer with developing the first telephoto lens: he applied for a British patent in 1891 with a positive cemented doublet in the front of the lens and negative triplet in the rear. Almost simultaneously, Adolph Miethe applied for a German patent for a nearly identical lens, and the two spent the next few years ritually accusing each other of idea theft in various journals. Because of their bickering (along with the fact that Johannes Kepler and Peter Barlow had both described the concept for use in telescopes many years before), neither patent was ever issued, so the telephoto design was open territory for every lens manufacturer. Dallmeyer, Miethe and many others produced and sold telephoto lenses. Dallmeyer also marketed the negative rear element as a separate lens that could be attached to existing lenses – the first teleconverter. Other manufacturers began marketing sets that contained several negative rear elements and several positive front elements, in barrels that could be attached together. By varying the combinations of lenses used, photographers could create lenses of several different focal lengths from their set of lenses. It was sort of the 1900 version of a superzoom: very convenient but perhaps not the best quality one could hope for. 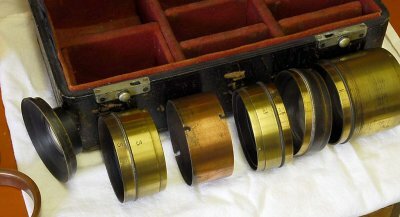 Image 3: A lens set from the turn of the century. In reality, neither Dallmeyer nor Miethe were the first to implement the telephoto lens principle for photographic lenses. A New Zealand geologist and photographer, Alexander McKay, had designed telephoto lenses in 1883 or 1884. He presented his photographs and described his lenses in a paper presented to the New Zealand Institute before either of the above gentleman applied for patents and at that time had already printed dozens of telephoto photographs demonstrating his lens’ effectiveness. One of McKay’s photographs, taken in 1886, shows the Russian warship Vjestnik anchored in Wellington harbor. The photograph was taken from a spot about two and a half kilometres away from the ship, but its rigging lines and gun ports are clearly visible. Image 4. I believe this is McKay’s photograph, but there is some controversy and I have not been able to verify it. McKay is possibly the most colorful figure in the history of photography (and that takes some doing, believe me). He emigrated from Scotland to New Zealand in 1863 at age 22. He spent several years prospecting for gold, then began working as a fossil collector for Julius Haast, the Provincial Geologist, and James Hector, the Director of The Colonial Museum of New Zealand. Although entirely self-educated, McKay was one of those brilliant individuals that not only was usually correct, he absolutely didn’t care if someone with more credentials thought he was wrong. He wrote the first papers describing sideways fault movements during earthquakes despite the fact the rest of the world (and his boss, Hector) knew that earthquakes only caused vertical movements. Time proved McKay was correct and the rest of the world wrong. 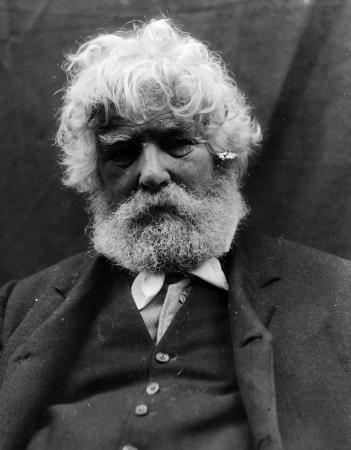 Later, when his other boss, Julius Haast, presented a paper claiming that the fossils McKay had collected for him showed a prehistoric culture had existed in New Zealand before the Maori, McKay presented his own paper at the same meeting demonstrating Haast’s theories were rubbish. The ensuing cat fight eventually was taken up by the Ethics Committees of the New Zealand Parliament and the Royal Society in London, apparently much to McKay’s amusement. McKay eventually became a geologist for the New Zealand Geology and Mines Department and took up photography around 1880. At first, he used photography simply to document his geologic observations, but very soon began experimenting in the field, making his own lenses so that he could take better images of rock formations and other objects far away. McKay states in his papers concerning telephoto lenses that he used discarded lenses from opera glasses to make the negative rear elements. Legend says that he ground many of his front elements from the bottoms of empty whiskey bottles. However, in his papers, he states he used the front elements from Rapid Rectilinear lenses, which were easy to obtain at the time. The legend probably arises from the fact that McKay himself said his greatest discovery was the fact that breakfast porridge was far better when made with whiskey rather than water. Looking at his picture, below, I tend to believe he felt that way. McKay did not join in the sparring between Dallmeyer and Miethe and never tried to claim the telephoto lens as his design despite the fact he clearly preceded the other two gentlemen. He had a lot of other interests including his continued studies in geology, cataloging a fossil collection with over 100,000 specimens, irritating Professor Haast, and making his special breakfast. He didn’t have time to worry about taking credit for a silly lens that he felt anyone could make on their own. Its also possible Mr. McKay didn’t want to take credit for designing the telephoto lens because the design had some problems that made it difficult to use. One minor problem was that the negative element basically enlarged the image and in doing so reduced the amount of light reaching the camera. It’s unavoidable: if you make the light circle twice as large, it’s only half as bright. So telephoto lenses had higher apertures (f/stop) than other lenses. The Zeiss Tele-Tubus and Busch Bis-Telar lenses of the turn of the century did well to have a maximum aperture of f8 at a 15 degree angle of view (about the equivalent of a 150mm lens on an SLR). The only solution was the development of very large front elements, which took a bit of time. A second problem is that the design of telephoto lenses tends to cause pincushion distortion. Early designers thought this was simply inevitable, but in 1923, H. W. Lee found this distortion could be eliminated. He did it by placing a biconcave airspace in the rear negative lens. It’s no longer an issue with good prime telephoto lenses, but you still see the pincushion distortion in many telephoto zooms at the long end, because it’s difficult to correct for it at all the focal lengths of a zoom. The biggest problem that telephoto designers faced, however, was longitudinal chromatic aberration (This isn’t the purple-fringe lateral chromatic aberration, rather it is front to back, making the different colors of light focus at different focal lengths.) The problem is solved by using low-dispersion glass, or even fluorite elements, to minimize the problem. It is for this reason that telephoto lenses today often contain 2, 3 or even 4 low dispersion or fluorite elements: they are required to keep longitudinal chromatic aberration under control. These elements are less critical in lenses that don’t have a telephoto design, which is why most standard length lenses don’t have nearly as many LD elements. Aspheric elements, which often are used to minimize edge and corner aberrations, are less critical on a telephoto lens with its narrow angle of view and you rarely see those incorporated into telephoto design. The telephoto design can be used for lenses of all focal lengths, but its advantages are, of course, most useful for lenses with long focal lengths. How long can they get? The the longest telephoto lens (as opposed to a telescope, which is entirely a different thing) I know of is the Zeiss 1700mm f4 Apo Sonnar, weighing in at 564 pounds (that’s a medium format camera mounted to it in the picture below, to give you some perspective). If that’s out of your price range you can still grab a Canon 1200mm f5.6 from B&H for about $100k. No, wait. It has apparently been sold. So I guess you’ll have to be happy with the little Canon 800 f5.6, which at $12,500 is clearly a bargain. So yet again, I have written the last article in my “history of lens design” series. Except that it’s already occurred to me that if I wrote about telephoto lenses I’m going to have to go ahead and cover reverse telephoto (retrofocus) lenses before I go back to write about camera development. And that’s when we’ll discuss that back focal length from the figure above. Gross, H, et al: Handbook of Optical Systems. Wiley. 2008. Wilkinson and Glanfield: Lens Collector’s Vade Mecum. Any chance you can do a post on teleconverters? I started wondering (after the announcement of the Olympus 150-400) how a built in teleconverter works, but couldn’t find any information anywhere! After many hours..days… scouring, and finally a message lost in the Facebook OTHER message folder, I tracked down photograph of McKay’s telephoto lens! Stashed all this time at his grandson’s house in NZ. Grandson since passed away. I want to do a bit of a followup to the short article we wrote about McKay to clarify details about the lens. Perhaps you could look at this photograph and comment about what you see. I would like to say what kind of camera McKay probably used, approx size etc Assume it was a box bellows camera?? Oh, see you have link to a paper he wrote. Will check it out. What an interesting article on this amazing ggg-uncle of ours – thanks for helping to keep his legacy alive by posting this. Adam, many telescopes that are mirror-based do indeed contain positive and negative elements. The Maksutov and Schmidt-Cassegrain designs are good examples. The concave main mirror is typically around f/1.5 to f/2 by itself (with absolutely zero chromatic aberration!) but the convex secondary mirror spreads out the light cone to f/6 or f/10 in the Schmidt-Cassegrain and about f/15 in the Maksutov. That qualifies them as more extreme examples of the telephoto design concept than the all-refractive lenses discussed in this article. Of course, if you mean the ‘largeness’ of its area you’re correct, but if you mean its linear ‘largeness’ (which was my first impression) then the inverse square law applies. Not according to the inverse square law. The circle of illumination is doubled only in the one dimension represented by its diameter. It is in fact quadrupled when its two dimensional area is calculated. The f number representing the aperture will double, which is a two stop reduction, or a quarter the exposure. That’s probably because the reflex mirror doesn’t use a positive and negative group to reduce the length of the light path (it uses mirrors to let the light go back and forth across the same place to reduce the length of the lens). Why did you not consider a reflex mirror lens as a telephoto lens? Just discovered your blog…Am learning tons of useless photography trivia with which I can show off to my friends; can’t wait till somebody rattles off some plebeian remark about his/her telephoto lens so I can shoot them down. BTW, at this point, most of us have been around for the turn of the century. The early 1900’s were actually the turn of the LAST century… Just to make you feel that much older. See http://xkcd.com/386/ for another variation. There also exists a little known super-zoom that was made by Nikon, 1200-1700. In sheer range I think it trounces the Zeiss, but clearly looses out in max aperture and size/weight. Its not an absolute difference: you can take pictures through a telescope and look at stars through a telephoto lens. But rather the areas of emphasis. None of these are absolutes, but in general: telescopes are designed to work at great distances, telephoto lenses to be focused from near to far. Telescopes emphasize absolute light gathering power (hence an 85mm spotting scope or a 3 inch telescope are describing the absolute aperture, where a telephoto lens will use the f/stop formula of aperture and focal length). Telescopes are designed — usually — for center sharpness but don’t worry as much about a flat plane of focus or edge-to-edge sharpness. Designers of telescopes hate coma and distortion, but tolerate chromatic aberration, where photo lens designers are often the opposite. In practical terms, most telescopes do not let in nearly as much light for focal length as a telephoto lens would: a long exposure of the stars is no problem given the proper mount, but won’t work very well if you’re photographing a bird in flight. I love your articles. Please keep up the great work. As always your articles are entertaining if not informative (or vice versa). Fascinating read given McKays connection to New Zealand. Might do a bit of local reading on the man! Regards Snr Sgt Mike Whitaker, O/C Auckland Forensic Imaging Section, New Zealand Police. Something I’ve wondered about, which you mention right at the end, is that a telephoto lens is not a telescope. What is the difference between bolting a camera to a telescope and a very long lens?